Just Create: Twitter would have bought DC Comics to it's knees in 1964. Twitter would have bought DC Comics to it's knees in 1964. Good thing Twitter was not around in 1964. 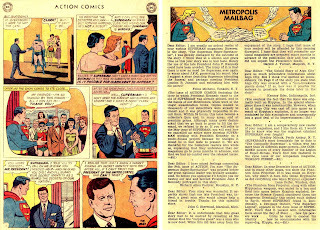 In 1964, Action Comics No. 309 was published. Once again Superman has to keep Lois Lane and Lana Lang from finding out his secret identity. He doesn't wear a mask. Why do people think he has a secret identity? Why is Superman such a blabber mouth? "I have a secret identity. I have a secret base in the Arctic called Fortress of Solitude. I can't see through lead." Back to the story. Clark and Superman have to be in the same place, at the same time, on national television. None of Superman's usual tricks are going to work. Who will masquerade as Clark Kent? Do I need a spoiler alert for a story from 1964? 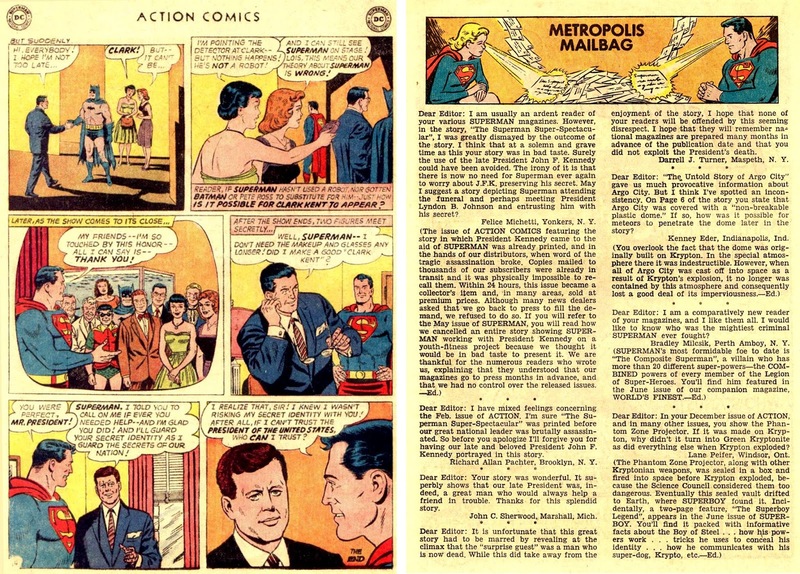 Superman gets President John F. Kennedy to dress up as Clark Kent and save the day. Hey, that's cool. Nice story. Unfortunately, the story came out after November 22, 1963. Oh,oh. You have stepped in deep doo-doo now DC Comics. Well, they stepped in it by mistake. This is not a condemnation of DC Comics who did nothing wrong, but was a victim of bad timing. The letters column in Action Comics No. 312 showed the resulting outrage at showing the beloved dead president. . Whoops, if Twitter had been around in 1964 we would have seen outrage. However, DC Comics chose which letters to print. The public got to read the reasonable, level headed responses. One can only imagine the amount of vitriolic, hate filled, savage and venomous letters they received. The editor - Mort Weisinger - did hint at these type of letters in his response. In 2018, DC Comics doesn't have this type of control over fans. One could only imagine what the result would be today.